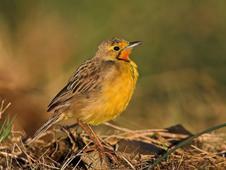 Cape Longclaw is endemic to grasslands in southern Africa. Climate change modeling shows that the range is projected to retreat south and contract considerably. The species could become extinct in Botswana and may be largely confined to regions of higher ground in South Africa. Cape Longclaw Macronyx capensis is endemic to southern Africa, occurring in a variety of grassland habitats from the coast to highlands (Harrison et al. 1997). Over much of its range it is a fairly common breeding resident. To assess the potential effect of climate change on its distribution, a climate envelope was modelled using the current known distribution of the species and a number of climatic variables. These included a measure of moisture availability and of summer and winter temperature. The resultant model was then applied to a future climate scenario (Gordon et al. 2000) to indicate the future distribution of suitable climate. This shows that towards the end of the twenty-first century the range is projected to retreat south and contract considerably. 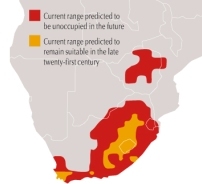 Cape Longclaw could become extinct in Botswana and may be largely confined to regions of higher ground in South Africa (see figure). Management necessary to safeguard the species should be concentrated in particular in those upland areas projected to remain suitable. Gordon, C., Cooper, C., Senior, C. A., Banks, H., Gregory, J. M., Johns, T. C., Mitchell, J. F. B., and Wood, R. A. (2000) The simulation of SST, sea ice extents and ocean heat transports in a version of the Hadley Centre coupled model without flux adjustments. Clim. Dynam., 16, 147–168. Harrison, J. A., Allan, D. G., Underhill, L. G., Herremans, M., Tree, A. J., Parker, V. and Brown, C. J. (eds). (1997) The atlas of southern African birds. Vol. 1: Non-passerines. BirdLife South Africa, Johannesburg.